Successfully Added VHF Wireless Microphone System - 200 to 270MHz Frequency Range, 50MHz Bandwidth to your Shopping Cart. 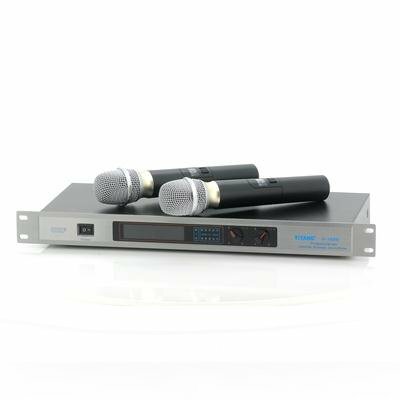 VHF Wireless Microphone System lets you control the stage and brings you the attention you deserve as it features a frequency range that is between 200 and 270MHz plus a 50MHz Bandwidth lets you be heard. Dominate the stage and be the center piece with this professional wireless microphone system. Coming as a package that contains two wireless microphones and a receiver it is easy to set up and getting you started. Ideal for karaoke parties, theater, drummers and stand up comedians, everyone will be able to hear your voice. As it is this is a very high frequency (VHF) microphone system it operates at a range of between 200 to 270MHz plus it also operates with a 50Hz bandwidth. Allowing a 50 meter operating range between microphone and receiver, you will not be tripping over cables as you perform making it very practical and safe to use. The microphones have a 30Mw maximum high frequency output and required you to insert two AA batteries into each of them to make them work. 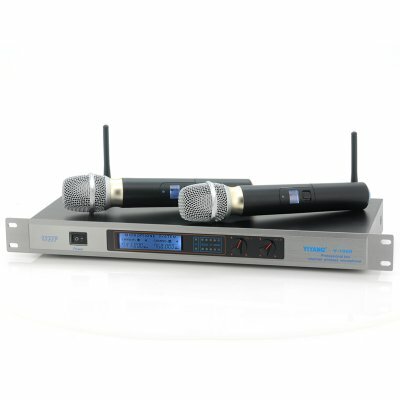 This VHF Wireless Microphone System is in stock and can be dispatched within one working day of ordering with a 12 month warranty. Brought to you by the leaders in wholesale electronics and home theaters, Chinavasion.